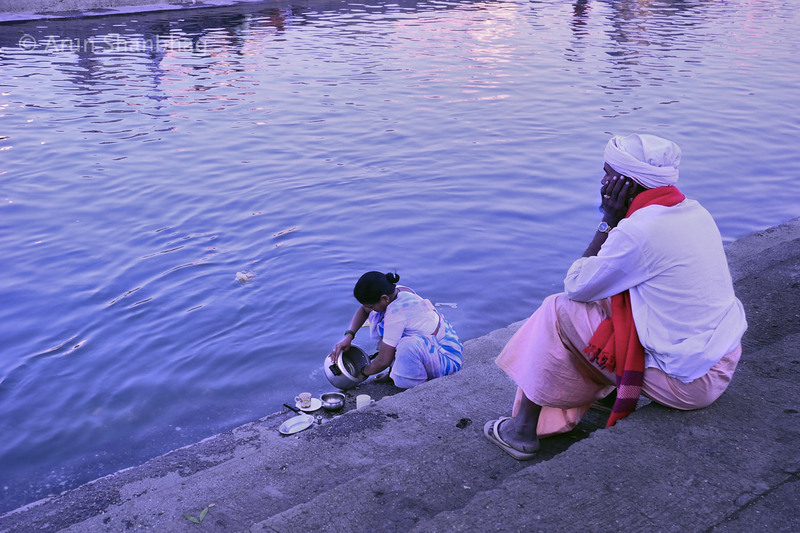 At the ghats in Panchavati, Nāshik, I was intrigued by this sādhu pondering the mysteries of sat and asat, while a lady was busy washing her cooking utensils. Verily a juxtaposition of the paths of Jñāna yoga and Karma Yoga. Which path to follow? This is a difficult decision for many to make. If you have not (yet) come across this quandary, consider yourself lucky. Mr Arunji you have put good question on your point of view.As a Gowda sataswat Brahman I certainly believe in karma yoga.One good old people saying do work hard in silence &let the success makes the noise. As many Swamis have told us, in this kali bug, Karma yoga is one of the easiest and best way to cleanse our vāsana-s, and purify our minds for the beautiful journey to the divine. Indeed a question which confounded Arjun even as Lord Krishna expounded the Bhagavad Geeta to him. I think it was well explained (if you pick through the subtleties) in the Bhagavad Geeta – Chapter 12:1 ~ 12:12 ; The Yoga of Devotion of all places! Whatever you believe will get you where you want to go will get you there…. ; for that is what you are ready for. As Swami Chinmayananda tells us, its the same road. You may start on Karma yoga and will end up on Jñāna yoga. So yes, you start where you will, or where your inclination is, or are prepared for – the destination is the same. So perhaps the question is not, Jñāna yoga OR Karma yoga, but to each her/his own. The destination is the same. Thank you for the thoughtful discussion.